Dortmund started the game at a high pace, using a high press as well as quick restarts of possession to give Hoffenheim’s defence a tough start to the game. Tuchel’s press was man-oriented in almost all positions, resulting in a spare defender at the back and Reus and Aubameyang with the task of covering Hoffenheim’s three centerbacks. The two forwards were quite successful despite the underload, with intelligent positioning allowing them to sustain defensive access. The pairing would often position themselves between the centerbacks so to block the connections between the chain. Doing so would effectively reduce the number of options available to the ball-carrier, reducing the level of protection as well as ways to progress through the field. In order to apply pressure on Vogt, they could press diagonally while keeping the side-backs in their cover shadows. The most essential assignment was handed to Ousmane Dembélé, who was responsible for limiting Sebastian Rudy’s influence on the game. The youngster would stay close to the soon-Bayern pivot, who has been a crucial figure of Nagelsmann’s positional play. Thankfully for Tuchel, his trust payed off and the winger handled his task well throughout the game and instead of being the focal point of their early possession, he usually resorted to being a decoy to enable passes into other teammates. Marking a single, fairly static player is a rather simple task, but what was particularly impressive about Dembélé’s defensive performance was his selection of moments to move out and press the ball-carrier while keeping Rudy in his shadow. Despite Dortmund’s best efforts, Hoffenheim were still able to develop attacks more vertically either through long balls up to Uth and Wagner or in their pre-planned combinations. In these moments, Dortmund’s five-man back line provided adequate protection. But overall it added to the pace of the match, and the first fifteen minutes were end-to-end and frantic. This undoubtedly played into the hands of the hosts, who gained an early lead through Reus and nearly doubled it after winning a penalty shortly afterwards but for the miss of Aubameyang (after the visitors made a great job of delaying the kick). Dortmund’s pressing wasn’t without its flaws, however. As Hoffenheim’s in-possession shape decided their opponents’, they could manipulate Dortmund’s structure to decrease it’s stability. One way in which they did this was by forcing Weigl to cover spaces high-up in the right half-space, as Kramaric began to drop more frequently in response to the opening exchanges. The six is excellent at the base of midfield, but is much less comfortable higher up in the defensive shape and with larger areas to cover. Hoffenheim looked to access the space behind Weigl. Not only would it put Weigl in an unfamiliar position, but it would increase the distance between him and the defensive line. This would simply provide more space for Wagner to drop into, in order to receive vertical passes from the first line and quickly lay the ball off (with Demirbay or Kramaric often balancing with a run into depth). As far as I know, this is an essential part of Hoffenheim’s offensive game, and the striker times his movements well. Alternatively, Demirbay would drift further over from the right side of midfield to occupy the same spaces. 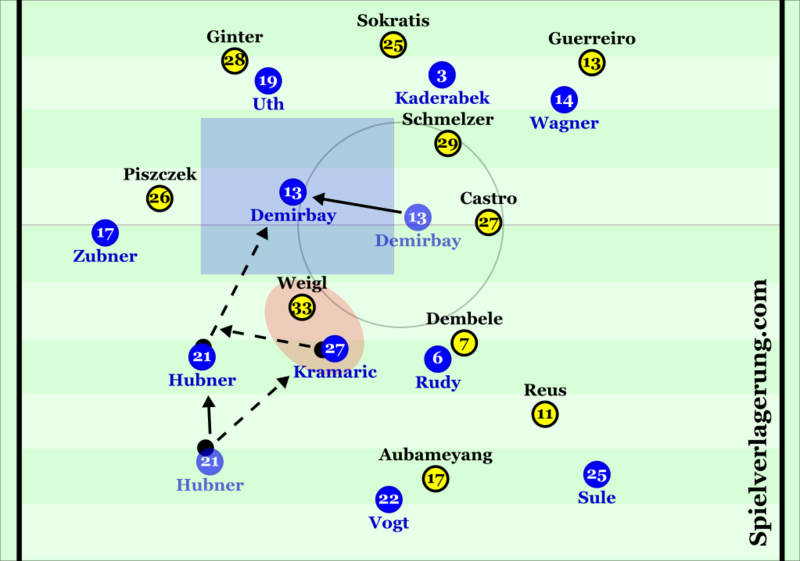 After the high-speed start gave the hosts their lead, Dortmund worked to reduce the tempo of the game with some longer spells of sustained possession. They spent more time in the build-up phase, and would patiently move the ball across the width of the pitch, looking to progress through the wide triangles formed naturally by the shape. Interestingly, their opponents seemed rather compliant with this change and spent more time in a deeper block themselves. With Weigl dropping close to the centerbacks, it became difficult for Wagner and Uth to establish defensive access and instead they focused on blocking progressive passes while waiting for a cue to press again. 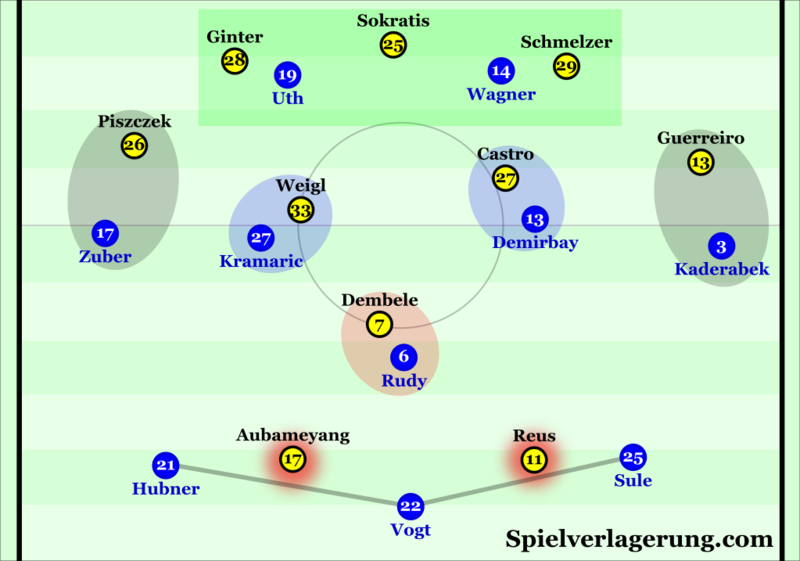 Their passivity became too much at times, particularly on the left wing where they struggled to create access on Ginter and Weigl, allowing Dortmund to make some nice switches to Guerreiro and Reus. The hosts’ defence receded into more of a midfield block too, which didn’t put the same impetus on pressuring Hoffenheim’s first line. This doesn’t mean that they didn’t defend with the same intensity, but instead it was applied when Hoffenheim got closer to the attacking half. 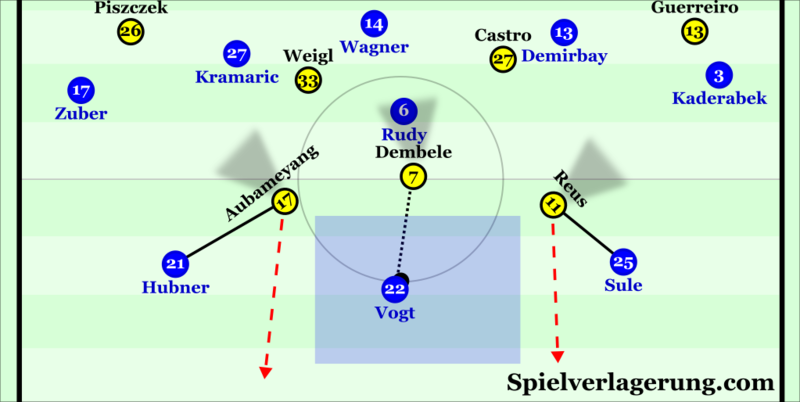 Reus and Aubameyang dropped away from the opposition’s defensive line and began to focus more on blocking passing lanes, while Dembélé stayed on Rudy. To block centre-to-wing diagonal passes from Hoffenheim’s defensive line. By having a wider positioning, the two forwards could potentially use their cover shadows to block any diagonal passing routes out to Zuber and Kaderabek. This would help to reduce the variability of the visitors’ attack and force them into narrower possession where Dortmund’s midfield was primed to intercept passes. Through their wider positioning, they were in better positions to immediately press the side-backs. This aspect would help to increase Dortmund’s access and threaten to create tackling opportunities in a dangerous position for Hoffenheim. On a related note, they could also utilise diagonal pressing to cut off the connections between the side-backs and Vogt as they attempted to in their early high press. Have a stronger starting position for transitions. Through their wider positioning in defence, both Reus and Aubameyang were in strong positions to make direct movements upon a turnover. Together they could attack opposing spaces and potentially stretch Hoffenheim’s defenders while Dembélé joins the attack from the middle. Aubameyang and Reus often took on wider defensive positions. At points however, the forwards were perhaps a little too wide and it became impossible to effectively pressure Vogt. In such cases, it became quite easy for the excellent centerback to pick a safe option through the centre of Dortmund’ defence. A crucial point of Dortmund’s defence was their back-line’s management of the opposing forwards’ movements. Sokratis and his teammates were regularly challenged with runs into depth from Hoffenheim attackers, lead by Uth with support from Demirbay and Kramaric. The two eights were often joining the front line in rotation with Wagner’s typical dropping movements, and could effectively go man-to-man with Uth to isolate defenders on long balls. Two players would also intentionally make runs in opposing directions so to increase the distances between the home centerbacks. Hoffenheim regularly threatened with runs into depth. 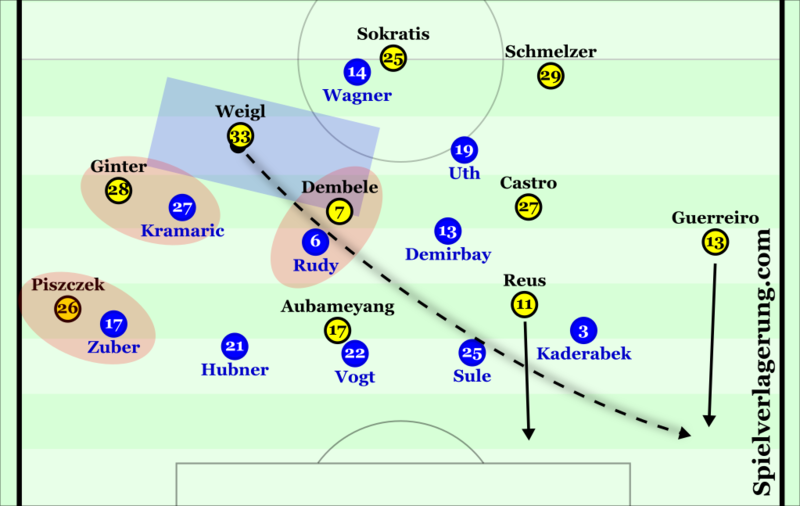 But Tuchel’s side maintained a fairly high defensive line and were able to manage the direct threat from Hoffenheim, even when Aubameyang and Reus stopped applying pressure to their opposing centerbacks. The coordination between the five men was strong, and they timed their runs well to minimise the space available to Hoffenheim’s forwards as well as catching them offside. Hoffenheim racked up 10 offsides throughout the 90 minutes, albeit with a little help from the sub-standard officiating. Not only was Dortmund’s overall adaption made to slow the pace of the game down, but to better protect the midfield gaps which Nagelsmann’s side were threatening to take advantage of. There became a greater focus on vertical compactness, which supported their control of the centre. The five-man defensive line was certainly a useful feature of their strategy, as it gave greater freedom for a centerback to leave the line and pressure any recipients of vertical passes. Dortmund’s defensive line worked well to nullify Hoffenheim’s vertical threat. From a deeper position, Tuchel also likely looked to utilise the pace of his front three in transitional moments too. Chasing the scoreline from the early minutes, Hoffenheim would inevitably become more open with the ball which would in turn offer opportunities for Aubameyang and Co. to exercise their speed on breaks. Dembélé in particular caused trouble in the second half, by receiving passes on the break in the space behind Zuber. The winger played a trio of low crosses to Reus and Aubameyang in the box but only one hit its target. And although they ultimately didn’t create any real chances in transition, they created some dangerous moments and perhaps the threat posed created some hesitancy with Hoffenheim’s possession game itself. With the drop in speed being a big aspect of it, Dortmund became much more focused on maintaining stability in the game. Their cautious and wing-focused build-up helped ensure a degree of security against any attempts to press or counter from Hoffenheim. Without the ball, the deeper and more compact defence gave better protection against the visitors’ vertical attacks. Both sides to the strategy played a key role in ensuring that their opponents barely scraped 0.5 expected goals together prior to the late penalty at 2-0. It wasn’t all plain-sailing however, and Hoffenheim had a number of promising moments in the second half. Shortly after restarting, they became more aggressive in their pressing and would take any opportunity to engage Dortmund’s back-line. The game became rather heated from their pressure which involved a number of fouls which probably aimed to disturb Dortmund’s younger members. The effect was probably as desired, with the game picking up a pace closer to what we saw at the beginning of the game. Nagelsmann altered his team’s shape too, in search of a way back into the game. With the introduction of Ádám Szalai for Benjamin Hübner, the away team shifted into a four-man defence with the new player slotting into the attack. Rudy maintained the pivot position while Nadiem Amiri took on a role in the left half-space with Kramaric more central. 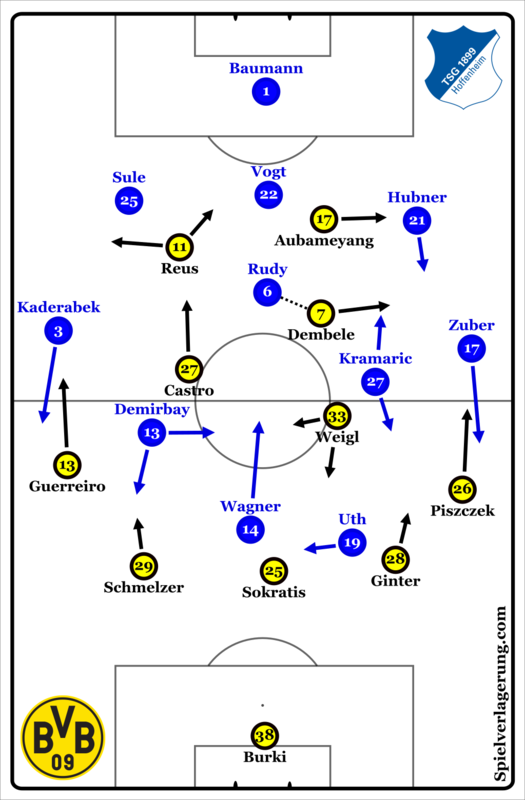 Ultimately these changes were to increase Hoffenheim’s presence on Dortmund’s defensive line, which made their direct attacks more threatening. A clear example being Amiri’s solo-effort in the 81st, where he was able to break into space vacated by a pre-occupied Schmelzer. They proceeded to dominate the share of the ball and were able to further raise the speed of the game. The hosts’ compactness began to decrease and gaps opened up between the lines of midfield and defence, as they were tiring both physically and mentally. In a typically-open last fifteen minutes, Dortmund were able to double their lead after taking advantage of an open and fatigued defence. They then handed their opposition a penalty which Kramaric converted in front of the Yellow Wall. From this point, Hoffenheim had a couple of attacks but they were limited due to Dortmund doing very well to run down the clock. What little opportunities they had, Nagelsmann’s team wasted with poor touches and the scoreline didn’t change again. In conclusion, Dortmund were completely worth their victory in a strong performance underpinned by excellent defensive work. Tuchel managed the game well after his side took an early lead, and his team’s defensive strategy was effective in reducing Hoffenheim to only the penalty for dangerous attempts on Burki’s goal.